The Gobi desert is one of the most beautiful places to visit in Mongolia. 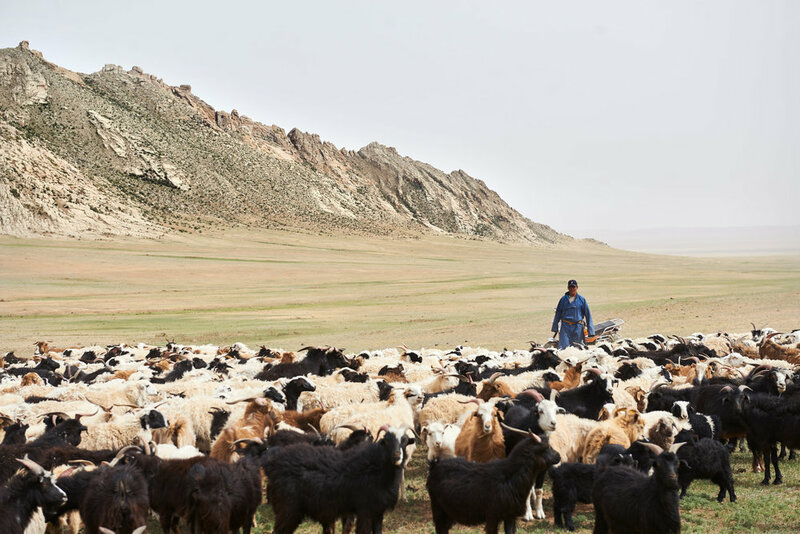 You will enjoy extremely remote landscapes, no cell phone coverage and nobody else around you in hundreds of kilometres apart from some nomadic families. 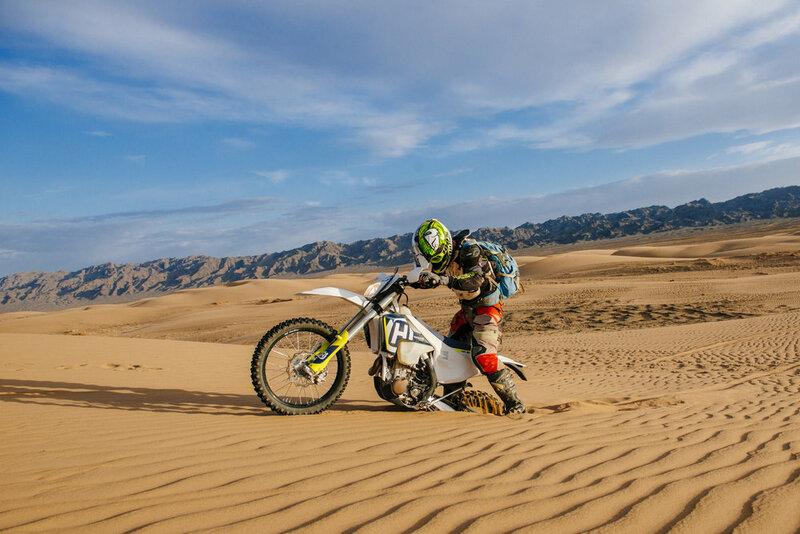 You will enjoy a combination of big sand hills, rocky mountains with old canyons, as well as wide forests consisting of small saxaul trees, riding all the way back to Ulaanbaatar through endless steppes. 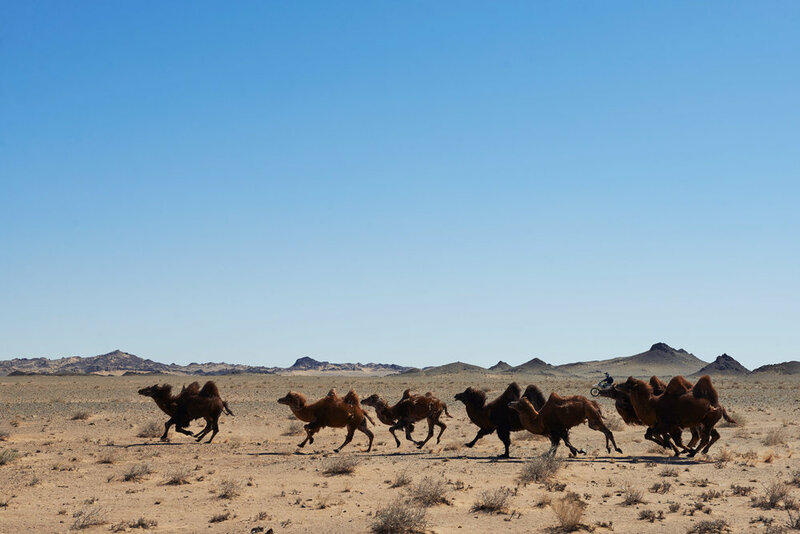 The Gobi is the fifth biggest desert in the world and is home to a wide range of animals such as antelopes and Bactrian camels, of which you will see lots! 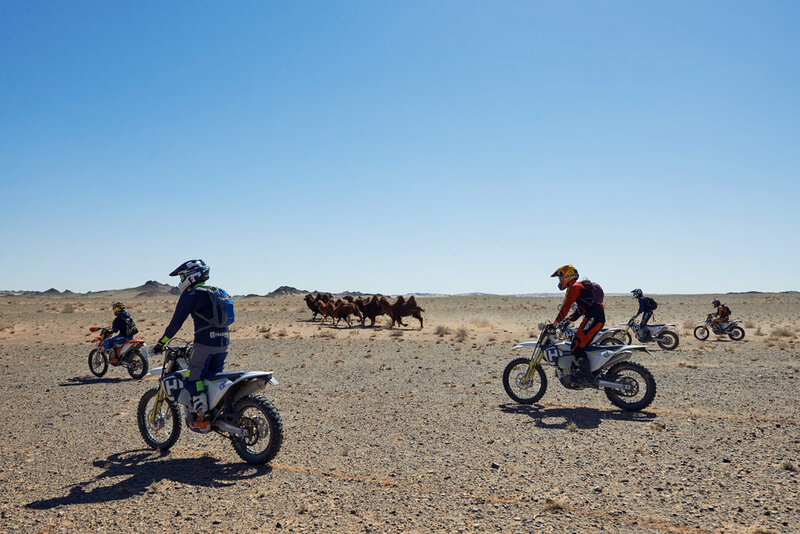 The highest part of the Gobi is 1,580 meters and the entire area has over 1.2 million km2, a true enduro paradise. The first dinosaur fossil eggs have been found at the red "Flaming Cliffs" of Bayanzag, where you will probably experience one of the most beautiful sunrises you have ever seen. 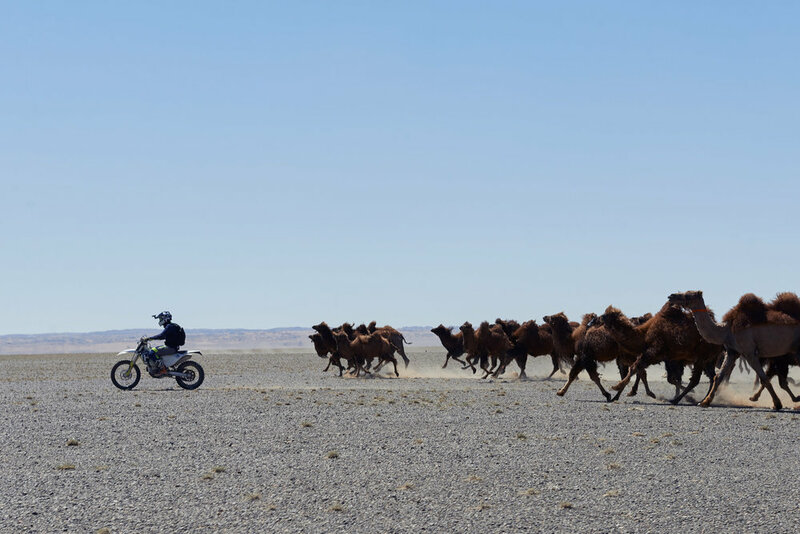 Riding through the famous ‘Flaming Cliffs of Gobi’, all in all an unforgettable once in a lifetime experience. 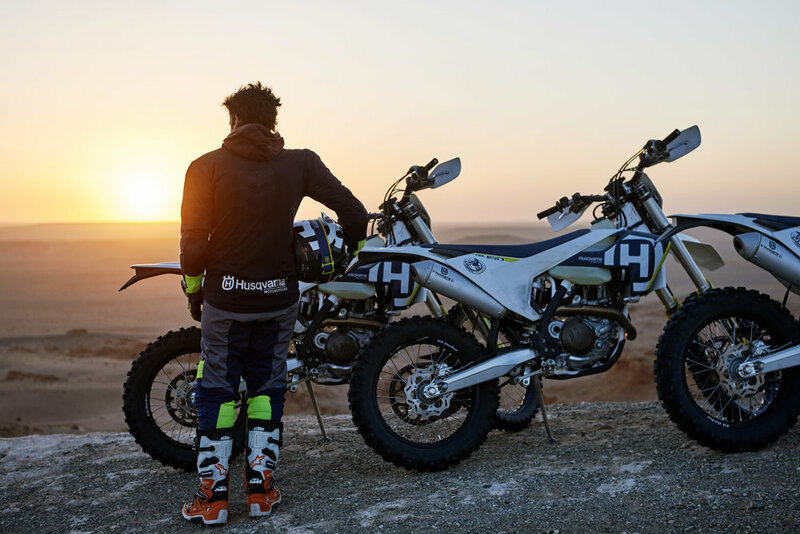 You will be picked up at the airport and taken to your hotel or our Husqvarna showroom to for your gear fitting - it depends a little on your arrival time. By the end of the day, all riders will have tried their gear and are ready to leave Ulaanbaatar early next morning. We are leaving from the shop by 9am latest via minibus to Dalanzadgad, center of gobi province, where the rest of the team and bikes are already waiting for you. 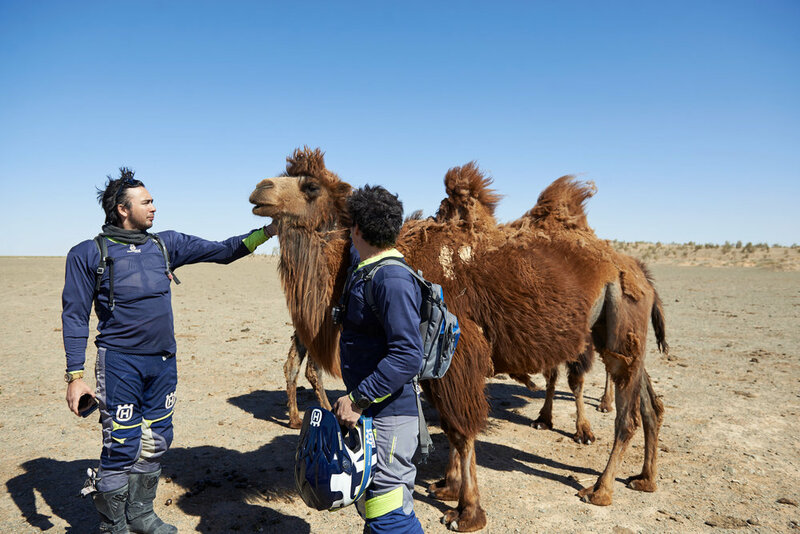 After checking-in to Gobi Oasis ger camp, a detailed security briefing for the tour will be held by our tour manager followed by an approx. one hour test ride so you can get used to your bike and equipment. Welcome dinner will be held at the ger camp! Exciting day ahead! 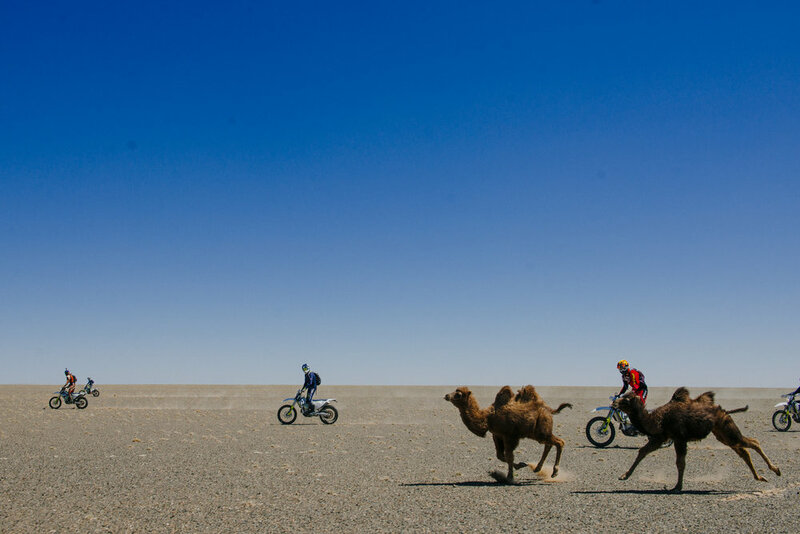 We will start riding to the biggest sand dunes in Mongolia. 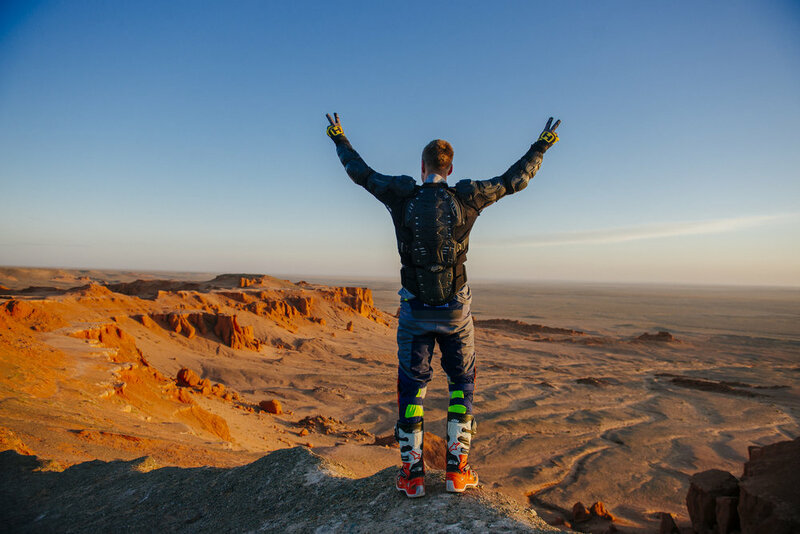 You will experience how amazing it is to ride an enduro bike in the endless steppes of Mongolia. Onthe way we will stop by at Yoliin Am Canyon which is full of glacier almost all year round.This national park area is a home to many animals such as Gobi bear, the world famous argali sheep and many others. Once we reach the dunes, we spend the night in our tents right next to the sand mountains, the beginnings of the Gobi desert. Bon fire and a delicious BBQ are following, rounded up by an unbeatable carpet of stars at night time. 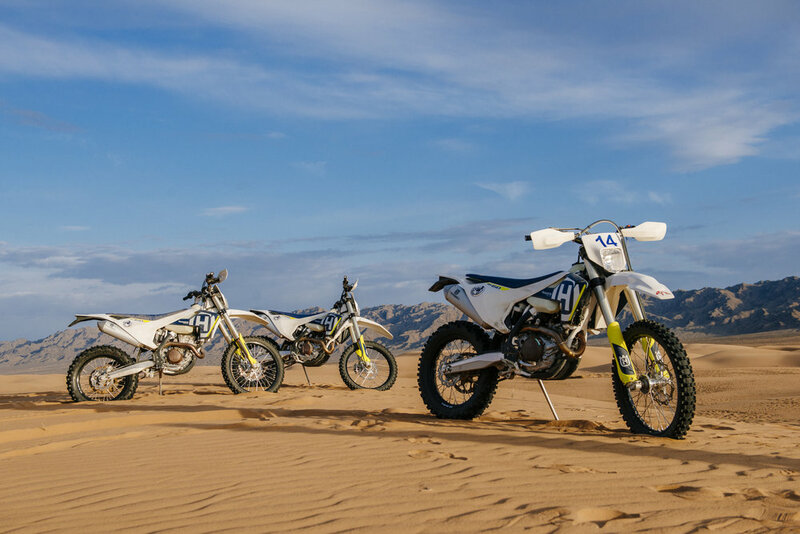 You can enjoy riding in the sand dunes in the morning before we are setting off to the breathtaking Flaming cliffs, where many important dinosaur fossils and eggs been found. Be prepared to see one of the most spectacular sunsets and sunrises Mongolia has to offer. 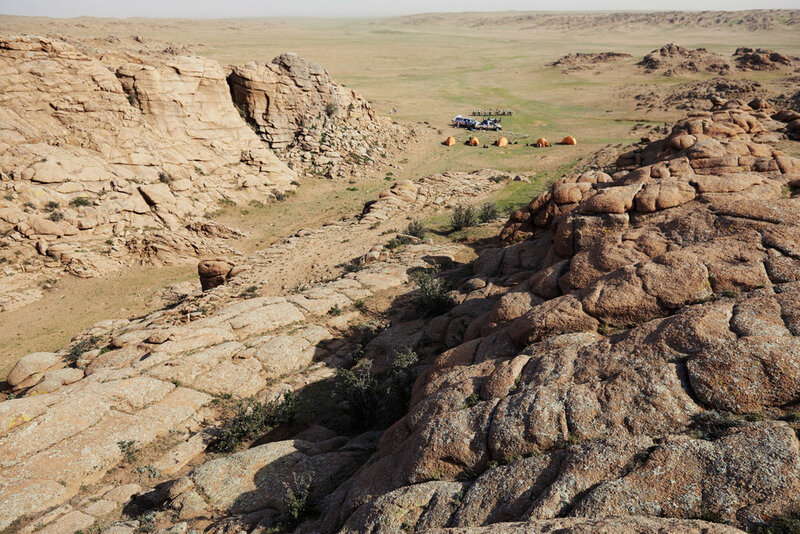 We will sleep at the Gobi Oasis 2 ger camp, only 10min ride away from the cliffs. We will start riding through nothing but open, dry plains. Adrenalin is guaranteed while gassing towards the seemingly endless horizon. Overnight stay will be in our tents, right by the side of Ongi river. The Ongi Monastery, built in 1660, was the biggest monastery in Mongolia and is close by too, walking distance. It’s going to be a long and exciting ride. We will go to the famous Rocks of Baga Gazarwhere you can admire beautiful granite rock formations surrounded by a plateau landscape.We will sleep in our tents in the open wild. We will head to our final destination, the National Park Zorgol Khairkhan where we will set up our camp close to some stunning rock formations. We will visit our Nomadic family that afternoon who are living down the mountain together with their kids, goats and horses. One last bon fire in the open wild that night. After having returned to Ulaanbaatar, you will have a short break and shower time at Viva City Hotel 3* (unless you have selected a different hotel during your booking) right next to our showroom. There will be time to do some cashmere shopping if desired, later we will meet at Ulaanbaatar’s best hot pot restaurant for a farewell dinner. Whoever has the energy to continue is welcome to enjoy the city’s nightlife, we will show you the best places to go to.